Do you have a band? Are you ready to take the stage and soak in the applause? 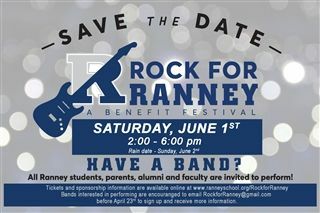 Then register to perform at Rock for Ranney! All Ranney alumni, parents, students and staff are welcome - at least one member of the group should have a Ranney affiliation. To participate as a performer, please complete the Band Registration Form or email RockForRanney@gmail.com. Become a Sponsor or Purchase Tickets! Looking for new marketing ideas for your business or company? Consider becoming one of our Rock for Ranney sponsors. Various levels of sponsorship are available and can be customized to fit your needs. Click here to review our sponsorship options or contact the Advancement Office at 732.542.4777, ext. 1181.